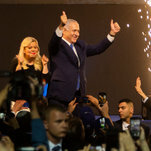 Prime Minister Benjamin Netanyahu of Israel and his wife, Sara Netanyahu, celebrating on Tuesday. 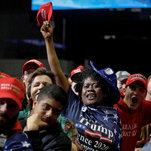 Trump supporters at a Make America Great Again rally in Grand Rapids, Mich., in March. 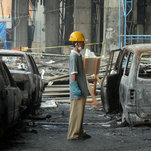 The aftermath of a bombing at the Marriott hotel in Jakarta, Indonesia, in 2003. Prosecutors are trying to charge three detainees at Guantánamo Bay for conspiring in the bombing.